A mysterious stranger from an alien race that’s not been seen for hundreds of years offers Louis Wu an assignment. His prize is a new propulsion technology that will allow the human race to escape from the galactic core explosion. His mission: explore the strange and unknown Ringworld. Accompanied by a human female and a kzin, Louis Wu accepts the puppeteer’s mission, and the four of them venture out of known space. Ringworld is classic sci-fi at its best. Larry Niven brings together futuristic world-building, technology, and anthropology to paint a compelling picture of humanity in the future. His universe (and the name of the book series), Known Space, is complex and exotic without being over-the-top. The Ringworld and its origins loom large over the explorers. Even after they land on the world, its decay and the continuing mystery of its creation torment explorers and the reader alike. The plot is simple, swash-buckling adventure. Though it’s light on any deep character development, Ringworld is filled with people who have strong and entertaining voices. Their interactions are realistic, and everything held my attention throughout the story. Niven has done an excellent job developing alien races: in particular, the kzinti and the puppeteers. 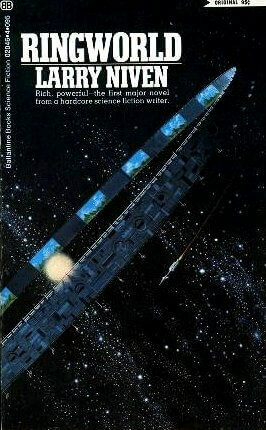 Sci-fi is so much fun mostly because of the fantastic world-building, and Niven sets a high bar. It’s an enjoyable and entertaining world that he paints. The story of the Ringworld does drag just a little bit, but it’s propped up by excellent characters. Teela Brown’s character arc adds interest to a mostly unresolved plot point revolving around the Ring. Without giving away too much, at the end of the story we still know very little about the Ringworld and its origins. It feels like the story had an end but was later stretched into a longer story, which is never promising. Still, I’ll be giving the next book a read. As long as Niven continues to make his excellent characters the focus, I can forgive a weaker story-line. And to say weak underemphasizes the fact that it’s enormously fun to follow these characters through their explorations. Even if they’re not getting much of anywhere, the series of vignettes that they go through is great fun to follow. Again, this is classic sci-fi at just about as good as it gets. And, in the book’s defense, the main story arc becomes Teela Brown’s luck and the revelation of the puppeteers’ “playing god.” These set up character-based plot points that will likely continue in future books, though they do marginalize the story of the Ringworld. I highly recommend Niven’s classic. It remains to be seen whether the entire series carries on the same excellent quality, particularly plot-wise, but Niven has done an excellent job of painting a sci-fi world. Ringworld is rightly regarded a classic in sci-fi. I look forward to reading the following books and spending more time in this world. Have you read Ringworld? Is there another book that you consider must-read sci-fi? Have you read Ringworld? Let us know in the comments or on social media.